Congratulations, Your Firm Made The List! Are you ready to create your own personalized plaque and put your accomplishments on display? Whether you want to create a display piece for your home or your office, a custom wall plaque is a great way to share your story with others. Fill out the form to the right. In order to craft the perfect plaque for you, we need basic information such as your name, contact information and specific info to correctly identify your article. Pick your plaque’s material, color and size. 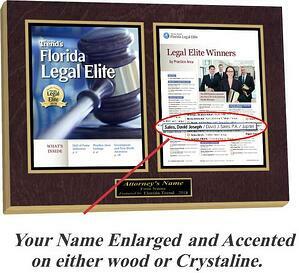 Do you want a crystaline acrylic plaque or a classic wood plaque? How about the finish and trim color? With so much variety, you’re sure to find the perfect plaque for your home or office. Verify your design choices with one of our representatives. After you’ve filled out the form to the right, one of our representatives will contact you within one or two business days to consult you about your plaque’s size, colors, engravings and other factors.